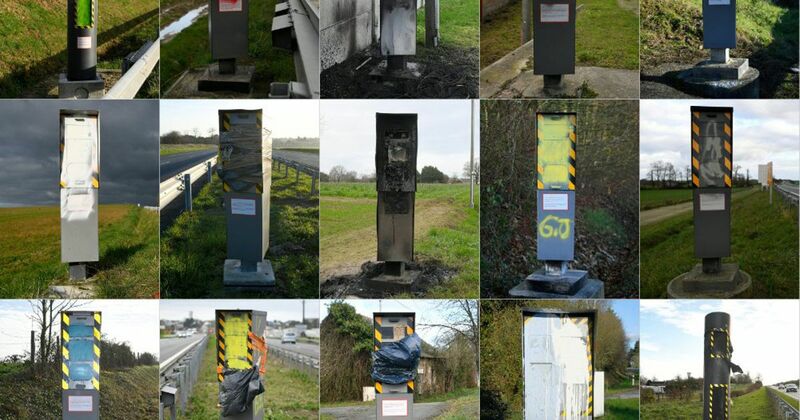 ... And here are some of those damaged speed cameras. Six in 10 speed cameras in France have been rendered useless by vandalism as protesters angry with tax rises take ‘revenge’ on the government. Spray paint, tyres, plastic wrap and even fire have all been used to disable around 1920 of the 3200 cameras, which some among the now infamous ‘gilets jaunes’ (yellow vests) protest movement see as purely an oppressive, authoritarian money-spinner from a government that favours the ‘urban elite’ over ordinary French people. The main yellow vest protests were until recently a fixture of a Parisian weekend, causing huge amounts of damage to property as hi-viz-clad crowds packed the streets to fight back against huge tax hikes that French president Emmanuel Macron had tried to apply to fuel – specifically diesel, upon which much of French road transport relies. While concessions from the government eventually thinned the size of the protests, speed cameras are also a target for the French people’s ire. Early in 2018 the national speed limit on many main roads (not all of them busy and/or dangerous) was lowered from 90kph (56mph) to 80kph (50mph), with fixed and mobile cameras on site to catch anyone defying the new rules. The gilets jaunes saw it as another of President Macron’s attacks on the ordinary driver and have seemingly been sabotaging cameras ever since. The government has responded by giving the police greater powers to crush ‘unsanctioned’ protests. Make of that what you will.